A swelling appetite for shrimps and prawns in America, Europe and Japan has fuelled industrial farming of shellfish in the past few decades. The industry now has a farm-gate value of $10bn (£6.4bn) per year globally and the prawn in your sandwich is much more likely to have come from a pond than from the sea. While the industry is dominated by the likes of China, Vietnam and Thailand, a large number of other countries have invested heavily in cultivation too. One is Sri Lanka, which saw the industry as a passport to strong economic growth and widespread employment. Just outside the world’s top ten producers, it accounts for approximately 50% of the total export earnings from Sri Lankan fisheries. More than 90% of the harvested cultured prawns are exported, going mostly to Japan. Yet the picture is decidedly mixed on a closer inspection. The country saw an explosion of unregulated aquaculture on the island in the 1980s and 1990s, bringing riches to a few and the hope of riches or at least an income to many more. But poor coastal management also brought white spot syndrome virus, a virulent disease that spreads in water and on the feet of birds, and can kill all the prawns in a pond in under a week. Crowding shrimp together in warm little pools full of nutrients creates the perfect conditions for an outbreak. It contributes to the fact that here and elsewhere in the tropics, most intensively farmed ponds remain productive for only five to ten years (the other main reason is the build-up of an organic ooze, rich in uneaten food and prawn faeces). Such ponds are then abandoned in favour of new areas of wetland to convert for another brief harvest. The disease kills off prawns in the wild in large numbers too. To get a sense of how bad the problem has been in Sri Lanka, I was one of a group of researchers who studied the Puttalam area on the west coast, one of the first in the country where large-scale aquaculture was introduced. We looked at satellite imagery from 1992 to 2012, which showed an explosion in prawn farms from less than 40ha in our study area to over 1,100ha (a rise of over 2,700%). This combined with a decline in natural habitats – mangroves lost some 36% of their area over the period. Yet most of these historic ponds are now unproductive or abandoned. The evidence from the satellite images combined with interviews with local people suggest that a staggering 90% of ponds are lying idle. 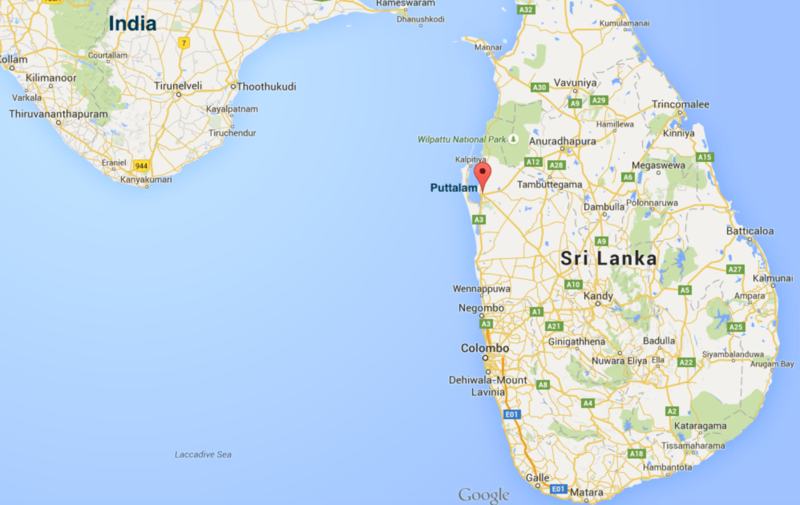 The story is unlikely to be quite as bad across the country as a whole, since Puttalam was one of the early areas to be cultivated. Detailed figures are thin on the ground, but certainly overall shrimp exports in 2012 were 65% below their 1999 peak. Prawn aquaculture has been likened to slash-and-burn cultivation – find a pristine spot, remove the vegetation and farm it for a few years before moving on. But the analogy is misleadingly benign. Slash-and-burn systems on a small scale can be sustainable, since the cut plots can recover afterwards. In the case of prawn farming, a better phrase would be “slash and sink”. 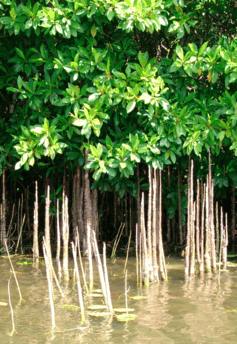 Mangroves are among the most carbon-dense of all ecosystems, often storing more than 2,000 tonnes of carbon per hectare in sediments beneath the forest floor, according to research that our group has yet to publish. Cut them down and this carbon is oxidised and emitted into the atmosphere as CO2. 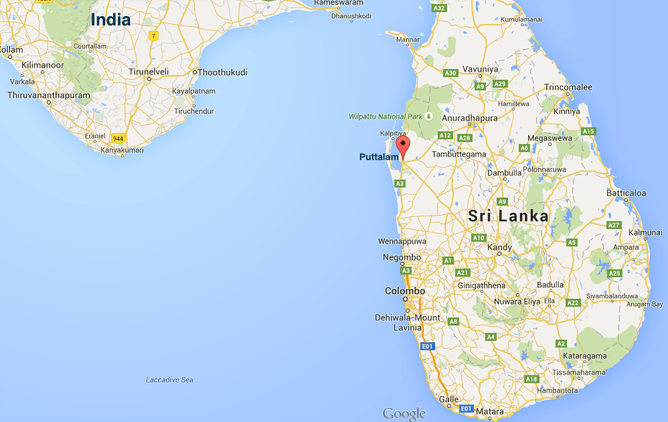 We estimate that nearly 192,000 additional tonnes of carbon have been added to climate change as a result of these land-use changes in Puttalam, Sri Lanka alone. And that of course excludes any emissions during farm operations and the potential for the lost mangroves to capture carbon in future. An additional issue is the sinking shoreline. In the face of global rising sea levels of more than 3mm a year, healthy mangrove forests are among the best protection since they bind together sediments and even elevate their soils to match the rising tide. Lose them and the chances of coastal subsidence, erosion and storm damage goes up. In fact, mangroves are such useful ecosystems that destroying them almost never makes sense, even from a narrow economic perspective. A recent analysis in southern Kenya showed that conserving and restoring the forests was worth at least $20m more in present value than allowing current cutting to continue. So what about Sri Lanka? 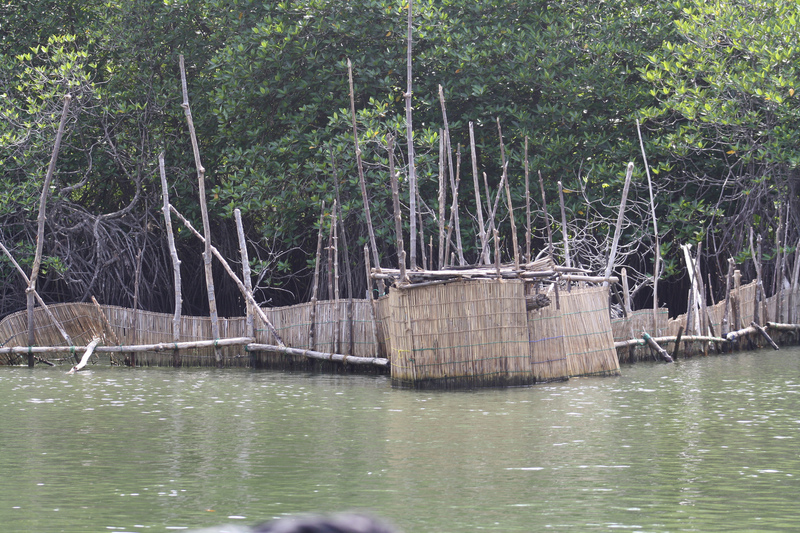 A positive recent development was that the government announced that it would protect all of its remaining mangroves, totalling some 8,800 hecatares. It also promised to replace a further 3,900 – a task that will require careful restoration of the right tidal conditions and planting trees where necessary. Another positive sign is that there are now local movements that are coordinating production among zones and farms to avoid disease and achieve better sustainability. This is on the back of a commitment by the government in 2010 to expand the industry. The country should also look to return some of its abandoned ponds to production, provided producers are supported to adopt best practice and work together to avoid disease outbreaks and pollution in future. As for us in the West who import these shellfish in vast quantities each year, we need to think harder about the real costs of that cheap prawn sandwich. Without knowing where it has come from and what farming practices have been used, we would do well to steer clear. Mark Huxham is Professor of Teaching and Research in Environmental Biology at Edinburgh Napier University .